We Take the Complexity Out of Asset-Based Lending. At Capital Funding Solutions, we do realize that there will be times when you won’t be able to raise funds through capital markets or unsecured bank loans. In fact, if it wasn’t for this understanding, we may not have put as much emphasis on asset-based lending as we do. 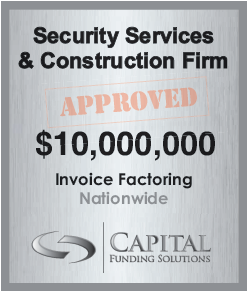 As a leading factoring company, we happily assume the responsibility of alleviating your funding issues. For you, what we do is to make this type of lending a lot less complex. If due to any reason you not been successful in raising capital and even the normal marketplace couldn’t help much, you can consider making the most of this type of lending. If your requirements need to be met immediately then there aren’t many other options that can remedy the situation. You won’t have to wait for weeks or months to get our nod of approval. Unlike banks, we specialize in factoring accounts receivables; so, if you have monthly receivables, we can easily help you expedite revenue into your working capital accounts. If asset based lending is a consideration for your company, please contact us for a no-nonsense, free consultation. There are several options available and a funding specialist can describe the best solution for your particular need. Contact: 1-877-545-1311.